Before you bring your first horse home there are a few things you need to know, and a few things you will need to have on hand when it arrives. You don't need to go out and buy a lot, but there are a few necessities, including food that you'll need. What are the basics of horse care you must know to look after your first horse or pony? 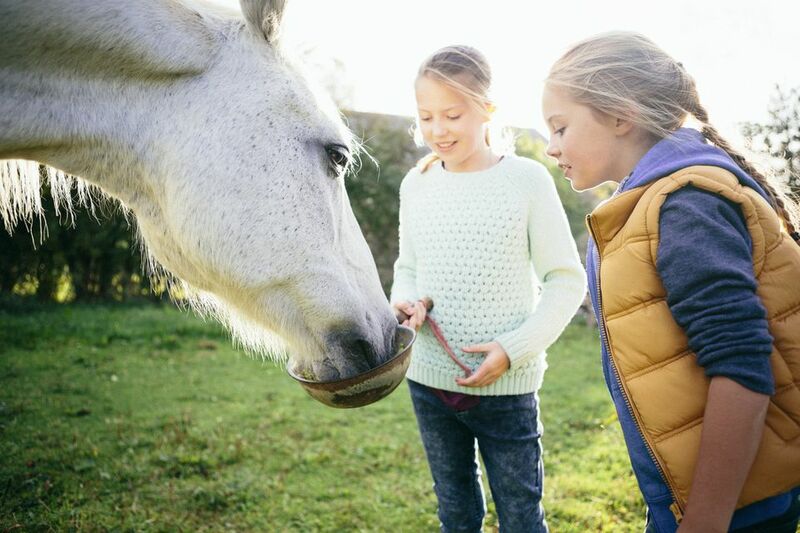 These horse care FAQs will answer your questions about basic horse care: food, shelter, costs, necessary equipment, alternatives to ownership and the time it takes to care for a horse or pony. Learn about basic horse care. What basic foods does my horse need? We all need to eat. There are some foods your horse absolutely must have to stay healthy and in good condition. So first, things first, here’s what to put on your grocery list for your new horse so you'll be ready when it arrives home. What are the basic needs of a horse or pony? There are a few things that your horse absolutely can not go without. These things all go to making a success of good horse care. Learn the basic needs in terms of the safety, comfort, and mental and physical health requirements of your new horse or pony. What basic equipment will I need before I bring my new horse home? You'll need to acquire a few basic tools and other equipment before you bring your new horse home. You don't need to buy everything in the tack store, but there is some gear that will make your handling and caring for your horse safer and easier. I can't afford to buy a horse. Are there other options? Not all of us can actually own a horse. That doesn't mean we can't be involved with the horse world, or learn to ride or drive. When you absolutely can’t afford to buy a horse or there is another reason, such as lifestyle, that prevents you from owning a horse, there are other options to keep in in the saddle. Explore your options if you are determined to ride to find out what is available to horseless riders and what is right for you. I have a big field. If there's grass can my horse just live out there without extra food? What about all the good grass growing out in the field? That's what horses eat, right? Is that enough? If you're lucky, it might be. But, grass alone might not be sufficient for a few different reasons including quantity and quality. Here’s a look at what your horse might or might not need besides the foodstuffs nature intended it to eat. What's the best type of fencing for horses? It would be great if we could just turn our horses loose and they’d come back to us. But, that rarely happens. Good fences make good neighbors and keep your horses safe and contained. Here's a look at the best type of fencing to keep horses behind and why some types of fencing are better than others. So what is all this horse care and riding going to cost? Things change over time, and prices fluctuate, although we call almost depend on them not going down substantially. Costs vary due to location and season. So, here’s a general break down of all the expenses you’ll incur in caring for your horse. What's the Difference Between a Horse and a Pony? Do You Have the Time to Care for a Horse or Pony?